I was beginning to wonder if I was on my own on this one. I too believe it's Nucks in 5. Quenneville vs. Vigneault even? Really, Dave? Vigneault was >this close< to being fired. I remember him back from when I was a Habs fan in Montreal. Didn't do much to impress me then. Of course all I know of Quenneville is what I'd heard from Pierre, but Pierre knows everything. Khabibulin was showing some signs of "slowing down" in the middle of that series, and Kiprusoff was not very good. Throw in their top three defensemen either playing hurt or getting knocked out and is it any wonder that the Hawks won? I believe Vancouver will be a much, much tougher opponent. On the other hand, can you ignore the rust factor? Bobby Lou better play lights out in game one because I think his team-mates may take a little time to warm up. Prags, I gave Viggy and Q 'even' grades because Alain not only did not get fired, he got his team to the top of the their Division. Not too shabby. Vigneault is a better coach now than when he was in Montreal. As an aside, Quenneville IMHO should be a Jack Adams candidate. Of course Vancouver will be a tougher opponent for Chicago...no question. Chicago will also be a much tougher opponent for the Canucks than were the Blues. Agreed? IMHO both Kipper and Khabby played extremely well in Games 1 through 4. The goals were more results of defensive lapses and offensive opportunism on both sides. In 5 and 6 Nik raised his play while Mikka's dropped off. Nik's 43-save performance last night was nothing short of world-class. McGuire, as we know, has nothing but contempt for hockey fans, as his anti-fan rant on Team 1200 this morning confirmed. CHICAGO (Canadian Press, April 29, 2009)- Jonathan Toews, the 20-year-old captain of the Chicago Blackhawks, got his first taste of the playoffs and like so many of his young teammates, he found out just how different it is from the regular season. "You learn that anything is possible and you can come back from big deficits. Also, if you take a shift off, it can go the other way, too," Toews said after the Blackhawks finished off the Calgary Flames in six games with a 4-1 win at Calgary on Monday night. It's the first time since 1996 the Blackhawks have won a post-season series. Next up in the Western Conference semifinals are the Vancouver Canucks, who have not played since completing a sweep of St. Louis last Tuesday. The Canucks split the four-game regular-season series with Chicago, winning the final two. Vancouver goaltender Roberto Luongo posted a shutout against Chicago in late March at the United Center. In their series-clinching win at the Pengrowth Saddledome, the Blackhawks used their speed and skill to finally subdue the more experienced Flames. And they got a remarkable 43-save performance in Game 6 from one of their tested veterans, goalie Nikolai Khabibulin. "We beat a heck of a Calgary team. That's a team that has plenty of playoff experience," right-winger Adam Burish added. "A lot of those guys have been in the Cup final. "Hopefully it answers some people to say 'You're not too young to win a playoff series.' "
Not anymore. After a short breather before starting the series at Vancouver, the Blackhawks won't have time to look back and consider what they've accomplished so far against the physical but injury-riddled Flames. "After the first series, guys are tired. I'm tired. It takes a toll on your body, but that's what makes it so rewarding and so much fun," Burish said. "Now it starts all over again. It's going to be so much fun. Every game is so demanding on your body and every day after a game, you just want to sit back and relax because it's mentally and physically so tiring, but that's what's so rewarding about it." When it opened the playoffs, Chicago had only 10 players with post-season experience. "I think anytime you have so many guys that go it for their first time, it takes a lot out of you," said defenceman Brent Seabrook, who played a solid first-ever series against Calgary with a goal and five assists. "We learned a lot of stuff throughout the games and I think we've got to take that into the next series." davetherave wrote: McGuire, as we know, has nothing but contempt for hockey fans, as his anti-fan rant on Team 1200 this morning confirmed. davetherave wrote: The Namedropper was on a MAJOR rant today on his call-in to TGOR. "Fans think they know what goes in the playoffs. They DON'T KNOW. I KNOW. Because I'VE BEEN THERE." Please feel free to e-mail TGOR to get this clown canned. McGuire even said the Canes-Devs has been "a homer series"...which is, as we know, each successive game having been won by each team regardless of home ice, simply not true. Exercise your rights as hockey fans! CALGARY - Lot of good matchups in the West semifinal series between the Hawks and Canucks, starting in goal with Nikolai Khabibulin and Roberto Luongo. The Hawks' defense did a good job shutting down Jarome Iginla and Olli Jokinen, but now it gets tougher with Daniel and Henrik Sedin, Mats Sundin, Pavol Demitra. Alex Burrows and Ryan Kesler presenting all kinds of problems. Look for Duncan Keith and Brent Seabrook to be on the ice whenever the Sedins are on. The Canucks have a physical defense, but the Hawks showed against the Flames they can hold their own physically. Game 1, likely on Thursday at GM Place, could be key with the Hawks having some momentum and the Canucks off since last week. Looks like another long series, six or seven games. The Canucks are the favorites, but don't sell the Hawks short. They could win the thing. "Detroit et Chicago en finale de l'Ouest"
IMHO Normand Flynn may be the most astute commentator in francophone hockey media. This is quite an interesting analysis which I shall post in translation for our GM Hockey Members. Canucks in 7! This one will go the distance. The Canucks will be a challenge. They have a great goalie. But great goalies can be beaten. Bobby Lou hasn't won the Big One yet. Neither has Vancouver. And how many Canucks have Cup rings? The pressure is all on Vancouver. Chicago has already delivered on this year's promise. The Blackhawks are taking it one step at a time. Brian Campbell said it very well: "We have the horses to do it and who knows what can happen." 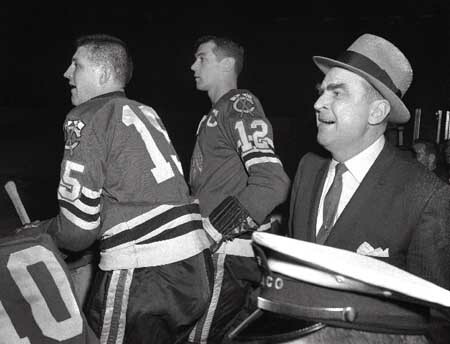 These Hawks are inspired by their Championship predecessors. Now...stealing a game at GM Place would be just the thing. Luongo is heating up just at the right time... he will be the difference in this series. shabbs wrote: Luongo is heating up just at the right time... he will be the difference in this series. shabbs wrote: Canucks in 7! This one will go the distance. Heh heh...do you have a Nucks jersey? I personally cheer for the Canadian team when the Sens are out excluding of course the Habs and Leafs because I just can't do it. I understand the Canadian player content argument but I still feel that urge to cheer for the team based out of a Canadian City.